iPhoto is a great program and understanding the basics is intuitive and easy. To really extract the power of this program, a guide like this helps. Unlike many tech books, this focuses on practical applications and where to use them rather than a list of features and how to use them. Detailed real-life examples are used to explain confusing (at least to me) concepts such as histograms, gallery effects, and raw. 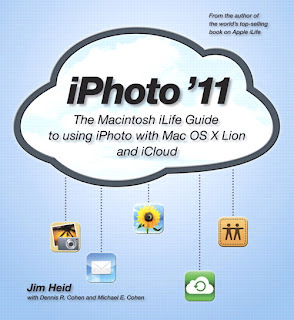 I also found extremely helpful the last sections of the book focusing on printing photos and using the greeting card, calendar and postcard functions. Again, this was about getting stuff done rather than what it could do. This guide is updated to include all the new features of Lion, iCloud and Photostream as well as the modern ways to use Facebook, Flickr and photo sharing. Each topic was presented with deleted screenshots and explanations without overwhelming you with details. On average, each topic was about two pages and just enough to understand without getting lost.